According to his relatives, Abdulrahman left the family home in the Sana'a area on Sept. 15 in search of his fugitive father who was hiding out with his tribe, the Awalak, in the remote, rugged southern province of Shabwa. Days after the teenager began his quest, however, his father was killed in a U.S. drone strike. Then, just two weeks later, the Yemeni government claimed another air strike killed a senior al-Qaeda militant. 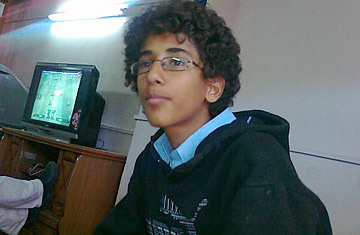 Abdulrahman, his teenage cousin and six others died in the attack as well. A U.S. official said the young man "was in the wrong place at the wrong time," and that the U.S. was trying to kill a legitimate terrorist  al-Qaeda leader Ibrahim al-Banna, who also died  in the strike that apparently killed the American teenager. Abdulrahman's distraught grandfather is not buying the explanation. Nasser al-Awlaki, who received a university degree in the U.S., had for years sought an injunction in American courts to prevent the Obama Administration from targeting and killing his son, Anwar. He told TIME, "I really feel disappointed that this crime is going to be forgotten. I think the American people ought to know what really happened and how the power of their government is being abused by this Administration. Americans should start asking why a boy was targeted for killing." He continued, "In addition to my grandson's killing, the missile killed my brother's grandson, who was a 17-year-old kid, who was not an American citizen but is a human being, killed in cold blood. I cannot comprehend how my teenage grandson was killed by a Hellfire missile, how nothing was left of him except small pieces of flesh. Why? Is America safer now that a boy was killed?" As for Abdulrahman's father, Nasser says that the U.S. "killed my son Anwar without a trial for any crime he committed ... They killed him just for his freedom of speech." He levels the charges directly at the U.S. President. "I urge the American people to bring the killers to justice. I urge them to expose the hypocrisy of the 2009 Nobel Prize laureate. To some, he may be that. To me and my family, he is nothing more than a child killer." Meanwhile, the U.S. is caught between prosecuting the campaign, which depends in part on intelligence provided by security forces loyal to Yemen's embattled government, and encouraging political change. Inspired by the Arab Spring, Yemen has been convulsed by nine months of antigovernment demonstrations that are now verging dangerously on civil war. U.S. diplomats have tried to manage a transition that will see President Ali Abdullah Saleh step down but keep the Yemeni state focused on counterterrorism. "America's view of our country is wrong, and motivated only by its own cynical interests," says Hassan Luqman, a demonstrator camped out in the indefatigable sit-in colony known as Change Square in Yemen's capital. "Its support for the regime is a dishonor to all the youths who have fallen as martyrs struggling against it." Western diplomats contend that while terrorism figures prominently in their concerns on Yemen, they are refusing to let the recent killing of several prominent al-Qaeda leaders distract them from the task of seeking a constructive political solution. "I'm sure the government hoped recent successes against al-Qaeda in the Arabian Peninsula would diminish pressure on them, but we maintain our line," a Sana'a-based Western diplomat said. "This hasn't changed the course on Yemen's long-term issues." But the campaign of aerial bombardments in Yemen, accelerated by the Obama Administration, has all too often missed its intended targets and killed innocents, aggravating the country's already dire humanitarian and security situation. In December 2009, a U.S. cruise missile crashed into a caravan of tents in the rural south, killing dozens, among them 14 women and 21 children. Despite an uproar by Yemeni rights groups and a detailed investigation by Amnesty International, U.S. officials refused to take responsibility for the bombing. More disastrously, an American warplane wiped out the deputy governor of the oil-rich Marib province along with his entire retinue last summer. They had gathered to accept the surrender of a wanted al-Qaeda militant who, finding the appointed site in flames, retraced his steps unscathed. A massive rebellion by the official's tribal kinsmen lingers to this day, and disturbances to the area's oil infrastructure have undercut the country's only lucrative export and severed the supply of electricity and fuel to millions of Yemenis every day. Yemen's restive southern province of Abyan has also been a focus of drone attacks and has been at the center of a ferocious, months-long battle between army units  supplied with essential provisions by the U.S.  and al-Qaeda-linked militants. Refugees from the fighting angrily recall seeing and hearing drones, and believe the government is deliberately exploiting the chaos to garner political capital from foreign powers. Her eyes aflame beneath a full black veil, Maryam, one of the refugees, noted, "I swear some of these bombs were American." Packed into a makeshift shelter in the port city of Aden along with dozens of other families, she insisted, "We saw aircraft  small planes  we had never seen before, zooming above us 24 hours a day and terrifying our children." Thousands of activists throughout southern Yemen, which had been an independent state until a bloody civil war imposed unification with the north two decades ago, see the al-Qaeda issue as a distraction from their legitimate grievances and calls for autonomy. "The south is rich in oil and sits along one of the world's biggest shipping lanes," says Hassan al-Bishi, a general in the former South Yemen and antigovernment activist. "If the United States continues to ignore our interests and focus only on one silly issue, we must seek other allies ... China or Iran, for instance." Cutting deeply into the country's political conflicts and across its broad expanse, the U.S. bombing offensive risks alienating the youth who will inevitably inherit Yemen's future. "I have one question for you," said one of Abdulrahman's young friends, his gloom turning to anger. "Who can't America kill?" Read "Yemen: The Most Dangerous Domino."